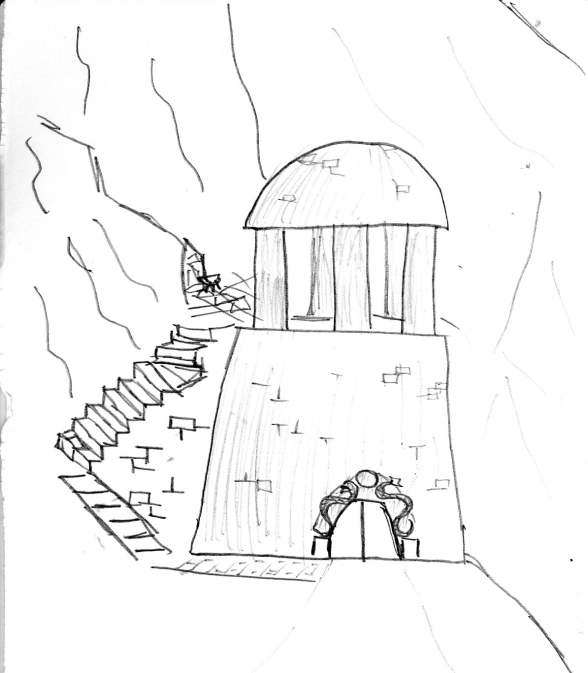 Larissa’s Lair: Small keep of desert bandits which may become a home base for the properly inclined. Unpublished. 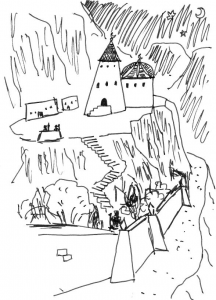 Jarmoco: Village of miners following the harsh tenets of Morg. Unpublished. 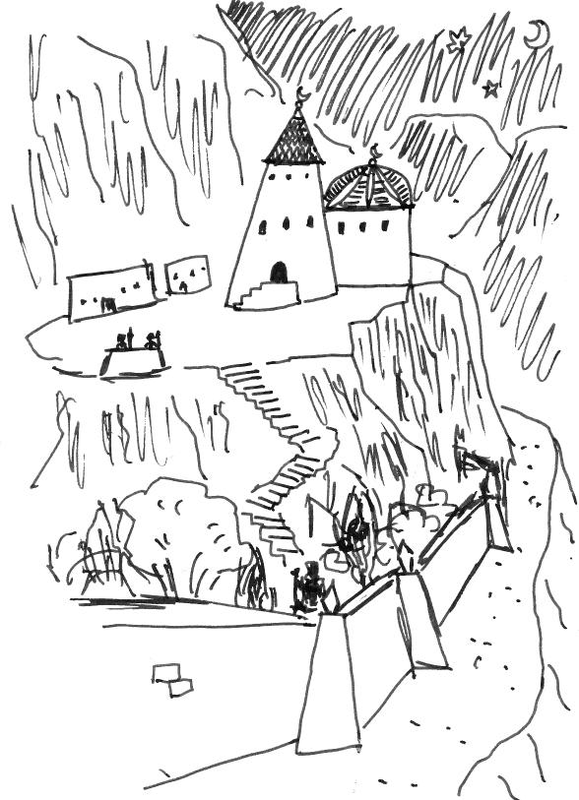 Black Baron Pass: Fortress of Dhazi Kathari, the man holding the pass against bandits and enslaves the beggars who walk the roads. Unpublished and never fully mapped. 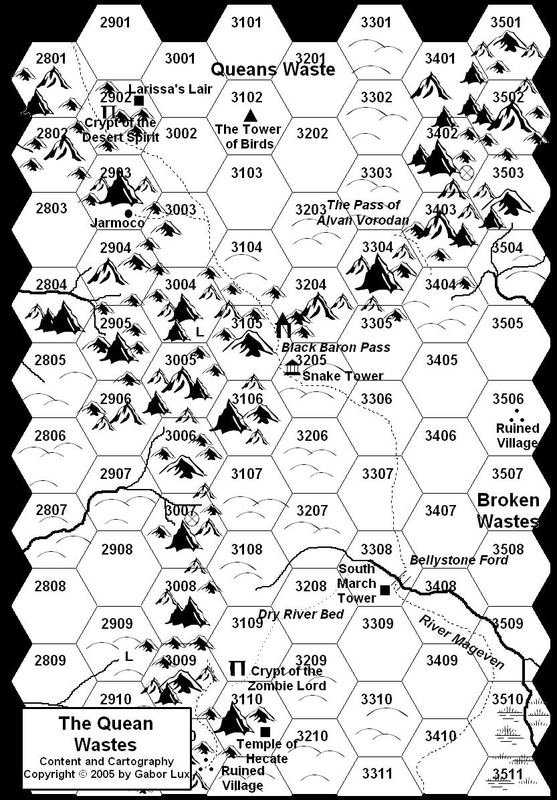 The Pass of Alvan Vorodan: A shunned place and prison of a god who had been broken by his rivals. Loose notes. Wasteland Travellers: A collection of four caravans and 20 interesting NPCs who may be encountered on the road or in Stone Gullet. 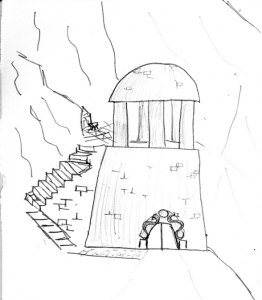 Some of them were written for a reversed murder mystery scenario where one of the PCs was the murderer acting under demonic influence; others were added when the fort was relocated to Fomalhaut. Crypt of the Zombie Lord: Small but vicious tomb-robbing scenario that’s bound to claim a life or two. Unpublished, and too small to stand on its own. The Temple of Hekate: A place to seek magical items and divination, or try to rob the priestesses. Unpublished, and lacks a real conflict to encourage player action. Design notes: Much as the unpublished foreword states, this is the sand that goes into a sandbox. The adventures and encounters are sword&sorcery-inspired with a touch of the unreal. I imagined the wastelands surrounding the roads as truly dead places where reality does not have a complete sway over the land, and evil dreams intrude where it breaks down. The strongest elements of the package, I Thirst, The Tower of Birds and Stone Gullet make for a formidable sequence that can put a campaign on track right from the start, and Wasteland Travellers is a good source for memorable minor NPCs (since many of them were written later, some of Fomalhaut’s weirdness creeps into what was originally straight-faced sword&sorcery). The other civilised sites have a lot of adventure hooks in store for a party that actively seeks conflict, but they may seem lacking for “default good” adventurers whose philosophy is to avoid it. Nevertheless, survival is a great motivation and it worked in both campaigns the materials were used. 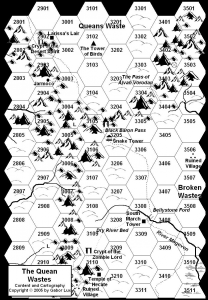 In the first, action started with the player characters exiled into the wastelands by the men of the Invincible Overlord for unknown infractions, and eventually ended with the partial destruction of Zothay by undead hordes from the sea; in the second, the arc was run as an immediate sequel to Systema Tartarobasis, and concluded with the party’s capture in a failed kidnapping attempt and their consignment to Khosura’s Pits of Lamentation. Hell yeah Gabor! BTW, I need your email address if possible? Blair — I will send you an e-mail instead (if you are still on Hotmail), too many bots hunting addresses out here.